We support clients who are actively building by providing third party energy efficient testing to verify that the desired level of energy efficiency is achieved. Energy efficient homes are air tight. 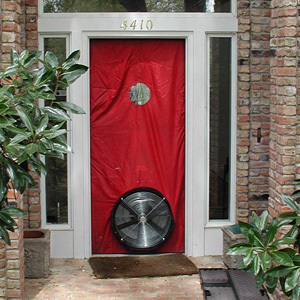 The blower door test actually measures the amount of air leakage the home has. Energy labeling programs and certain local building codes have established values that must be attained for a home’s air leakage. 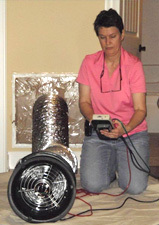 Energy efficient homes have tight HVAC ductwork. The duct blaster test actually measures the amount of air leakage the ductwork has. Energy labeling programs and certain local building codes have established values that must be attained for a home’s duct leakage. 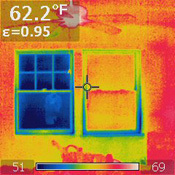 The Infrared (Thermal Imaging) camera measures surface temperatures of walls, floors, ceilings and other objects. The camera helps to detect areas of energy loss in your building by making hot and cold spots visible. An experienced user can use it to detect areas of heat loss and associated air movement, thus identifying portions of the building shell or building components that require further sealing prior to being finished, to improve energy efficiency. At Green River, we are experienced with these tools, and we often use them to help builders locate and eliminate the energy leaks that cost homeowners money and decrease their level of comfort. Give us a call today or contact us online to learn more about our energy efficient testing services.